Librarian, Colleen Nieland, and AP students Luka Morris and Natalie Ruckman listen intently as Dr. Penny Minturn answers their questions. Field trips offer students a chance to see how their in-class curriculum can be applied in the real world. On October 19th, some of Mr. Wilson’s AP and IB students were given such an opportunity to experience the “rewriting of history” at Omaha’s historical Offutt Air Force base. 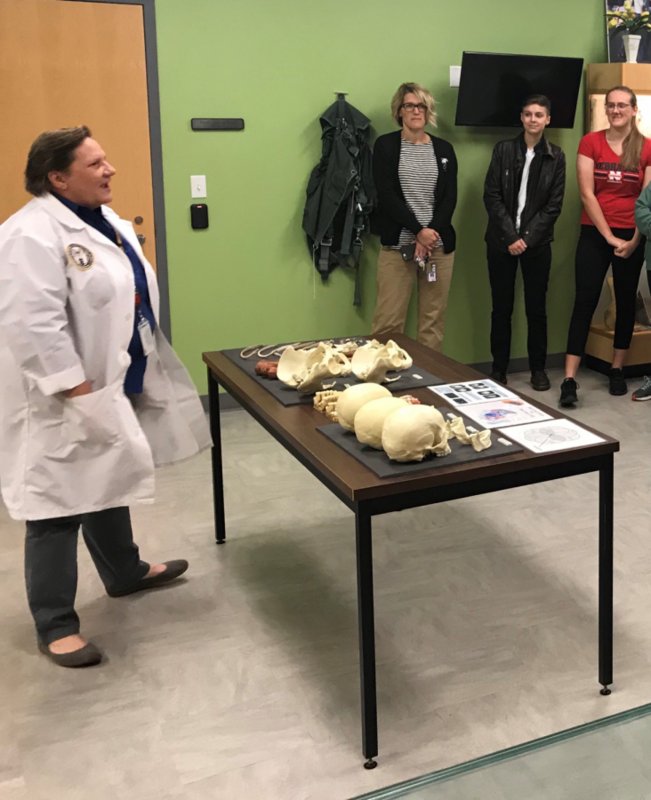 Students received a guided bus tour of the military base led by Ryan Hansen, and a lecture on the use of DNA to identify fallen soldiers, and other information regarding the DPAA. Housed in the Martin bomber building at Offutt air force base, the Defense POW/MIA Accounting Agency or DPAA’s mission is to investigate and attempt the recovery of all U.S. military declared MIA servicemen during past military conflicts from WWII through Vietnam. The DPAA has successfully identified 2492 fallen soldiers since the early 1980s (all of DPAA not just Offutt) and sent them home to their families to properly rest. The DPAA lab at Offutt was started in 2012 in preparation for the disinterment of the 400 men lost in the sinking of the USS Oklahoma during the bombing at Pearl Harbor. Between 600 and 700 people currently work for DPAA all over the world. However, that does not include the many people who only work on one mission, or the DPAA’s volunteers. For an individual mission, teams are usually comprised of between 15 and 25 Americans, and sometimes as many as 100 local laborers. On a typical Offutt led mission, there are usually 1 or 2 civilians, and anywhere from 13-23 military personal involved in the recovery process. Linguists are often part of the military crew and are often also naturalized US citizens (immigrants from the countries in which the missions typically take place). However, for work sites located in countries, such as France or other European nations, DPAA must contact local governments to ask for linguist recommendations. Typically, a good linguist is fluent not only in the language but the local customs and social rules of the area as well. Many students had a similar reaction to the experience (fieldtrip), as Minturn has when doing her job. Although the field trip lasted for a mere 3 hours, it has left a lasting impact on the students in attendance. AP senior, Natalie Ruckman was inspired by this amazing opportunity, to pursue a career in math or science and IB senior Madison Reed shared that, “I had a great experience learning that we have the technology right here in Nebraska to find people’s family members and friends that have been missing for decades. It is inspiring to know that families can finally be at ease and are finally able to bury their lost family/friends”. Reed and Luka Morris expressed that they were not sure what to expect before the excursion occurred but found the trip to be a fascinating experience.